The town of Bedfordshire, England wants to build the world’s biggest pool for space training. Vickers spent his childhood dreaming about both undersea life and outer space. (One of his earliest memories is watching the 1975 TV broadcast of an Apollo and a Soyuz spacecraft docking, when he was eight.) If he can execute his vision, Blue Abyss will open in 2019 in Bedfordshire, England, on the grounds of Royal Air Force Henlow station, which last year was listed for closure in 2020. Most of the base will be transformed into housing, but the Bedfordshire city council wants part of it earmarked for a science and technology park and hopes Blue Abyss will fill that space. The multi-level facility will house the world’s largest and deepest pool—at 11 million gallons, it will be the equivalent of about 16 Olympic-size swimming pools. 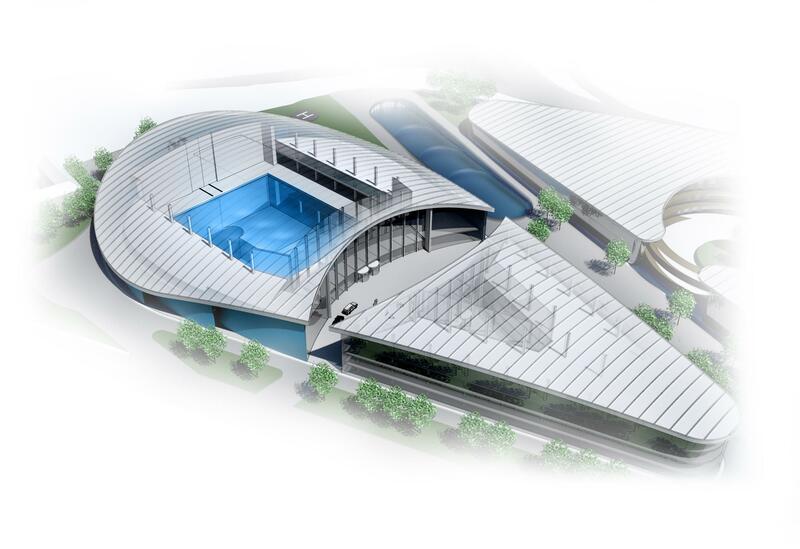 The natatorium will be devoted to both recreation and research and training for space and deep-sea missions. UKSpace, a trade association representing most of the country’s space industry, announced its intention earlier this year to capture 10 percent of the global space market by 2030. Vickers sees Blue Abyss as an essential component of this goal. Although the company does not yet have formal agreements with the European Space Agency or NASA, Simon Evetts, space operations director for Blue Abyss, says they’ve recruited NASA astronaut Scott Parazynski to get the facility certified at the level that government agencies require to conduct neutral buoyancy training. Once certified, the pool will offer professional astronauts a laboratory to practice mission operations for days or weeks and an underwater habitat to simulate the lesser gravity of the moon or Mars. Evetts says that initially, most of the revenue will likely come from the marine energy sector. The United Kingdom is in the midst of decommissioning the oil and gas rigs located in the North Sea; it’s an enormous task currently projected to cost $75 billion, a number that keeps rising. Evetts says Blue Abyss wants to work with those companies, using the pool to develop and test less costly and more efficient disassembly methods. Beyond the pool, Blue Abyss plans to add equipment to make use of the existing centrifuge footings at RAF Henlow so customers can experience the G forces of a launch, and are in talks with 2Excel Aviation to offer parabolic flights. A partnership with a group of university scientists will use data gathered from these activities on site, including Blue Abyss’ Human Performance Center, which will offer STEM courses for students of all ages. Once companies like Virgin Galactic and Blue Origin begin space tourism flights, the facility plans to offer training for civilians. And even if you never buy a ticket to space, developers say you can play Neil Armstrong in Blue Abyss’ adult space camp, in which customers can spend a week underwater in “moon” or “Mars” habitats, taking part in many of the same experiences as the pros. The plan is ambitious, and several pieces still need to fall into place before Blue Abyss breaks ground in six months, as Vickers intends. To get to the construction phase, he’s negotiating funding with several private investors, as well as applying for government grants that fund initiatives within the energy industry Blue Abyss intends to support. (Vickers and his management team are currently all-volunteer.) If the massive effort is successful, in just a few years, Blue Abyss will be welcoming their first customers to take a dip in the biggest pool on Earth. This article was originally written by Tracy Staedter abd appeared here.